SAN DIEGO -- The Chargers announced Tuesday that they'll pursue a stadium project in downtown San Diego, in conjunction with a planned expansion of the convention center, with the aim of placing a citizen's initiative on the November general election ballot. In making their decision, team officials rejected city and county of San Diego offers to build a new facility next to existing Qualcomm Stadium in Mission Valley. Chargers special counsel Mark Fabiani said the arguments for Mission Valley were compelling in many respects. "At the same time, we have considered the potential benefits to both the greater San Diego region and the Chargers of a multi-use stadium/convention center facility downtown," Fabiani said. "The multi-use facility, when combined with Petco Park, the existing convention center, the Gaslamp Quarter and a revitalized East Village, would create an unparalleled entertainment and sports district that will host Super Bowls and will ideally be a permanent home for Comic-Con and a Comic-Con museum," he said. "All of our research demonstrates that voters are more likely to approve a multi-use facility that would generate economic activity on hundreds of days per year, including by attracting major sporting and convention events that San Diego cannot now host." Fabiani said a downtown project would free up the Mission Valley site for potential use by San Diego State University and UC San Diego, both of which have eyed the property for years for expansion. The Qualcomm stadium site could also be used for a large riverfront park. Comic-Con officials, in response to the Chargers' announcement, said: "We have had no discussions with the Chargers and were surprised to be mentioned in their recent statement. We hope the public is aware, and we would like to reiterate our ongoing belief that a contiguous convention center expansion is the preferable solution to the limits on current convention center space. Comic-Con has doubts that a multi-use facility would serve the best interests of potential conventions hoping to exhibit in San Diego." A coalition that includes former Councilwoman Donna Frye, lawyer Cory Briggs and the development firm of ex-Padres owner John Moores formed last year to push such a project. Their plans include building more convention center space that's not attached to the existing facility, so it wouldn't be the contiguous expansion sought by tourism officials. The decision came after a couple of weeks of talks between Chargers representatives, and negotiators for the city and county of San Diego -- including Mayor Kevin Faulconer and Supervisor Ron Roberts. Prior to those talks, National Football League owners voted to let the Rams return to Los Angeles, and rejected a joint proposal by the Chargers and Oakland Raiders to build a stadium in Carson. The Chargers, which have a one-year option to be the second team, along with the Rams, in a future stadium in Inglewood, subsequently announced they would play the 2016 season in San Diego while trying to find a local solution to the stadium quandary. In a joint statement, Faulconer and Roberts said the Mission Valley plan would deliver a new stadium without raising taxes, so a vote to approve it would only require a simple majority. 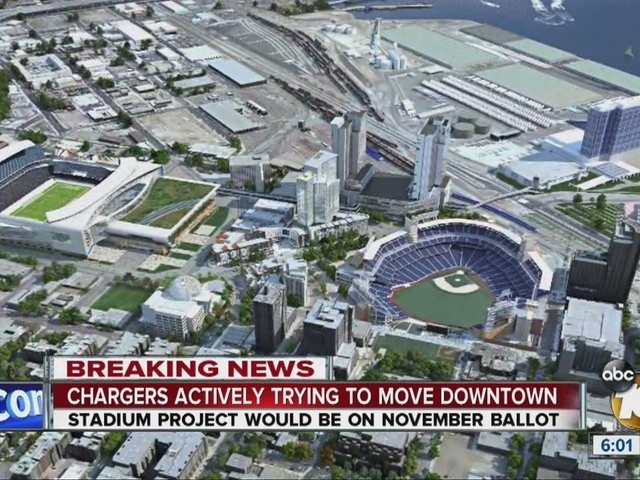 "Most experts we've talked to have concluded that building a stadium downtown -- on land not owned by either the city or the Chargers – would increase costs by hundreds of millions of dollars and take years longer to complete," Faulconer and Roberts said. "It remains unclear how the Chargers intend to finance a downtown stadium," they said. "But it is abundantly clear that a ballot measure that raises taxes for a stadium must be approved by two-thirds of San Diego's voters. This is an extremely high hurdle to clear. We remain committed to maintaining an open dialogue with the Chargers as we learn more details about their plan." At a news conference, Chargers stadium consultant Fred Maas said a joint project with the convention center could provide some "economies of scale" to lower prices. Team officials will explore their financing options to try to craft a financing plan that requires a simple majority vote. Maas said the Chargers will have to file their initiative with the City Clerk's Office by March 24 in order to begin the process of collecting petition signatures to qualify for the general election ballot. "We really focused on the opportunities -- do we really want to replicate another Qualcomm, or do we want to try to do something really special downtown," Maas said. SDSU officials declined to comment until they learned details of the Chargers plans. With Qualcomm Stadium likely to be leveled if a new Chargers facility is built, school administrators would have to decide whether to build a smaller stadium for the Aztecs football team either on campus, the former Qualcomm Stadium site, or play downtown -- a significantly longer trip for students. At the same time, we have considered the potential benefits to both the greater San Diego region and the Chargers of a multi-use stadium/convention center facility downtown. The multi-use facility, when combined with Petco Park, the existing Convention Center, the Gaslamp Quarter, and a revitalized East Village, would create an unparalleled entertainment and sports district that will host Super Bowls and will ideally be a permanent home for Comic-Con and a Comic-Con museum. All of our research demonstrates that voters are more likely to approve a multi-use facility that would generate economic activity on hundreds of days per year, including by attracting major sporting and convention events that San Diego cannot now host. The downtown multi-use facility would also free up the existing Mission Valley site for potential use by educational institutions such as San Diego State and UCSD, as well as for a large riverfront park. "We want the Chargers to remain in San Diego. After consulting with numerous experts on stadium financing and conducting a large-scale public outreach effort last year we proposed a straight-forward plan to finance a modern NFL stadium at the existing Mission Valley site. That plan would build a new stadium without raising taxes. Most experts we've talked to have concluded that building a stadium Downtown – on land not owned by either the City or the Chargers – would increase costs by hundreds of millions of dollars and take years longer to complete. However, it now appears that the Chargers intend to pursue a stadium in Downtown. It remains unclear how the Chargers intend to finance a Downtown stadium. But it is abundantly clear that a ballot measure that raises taxes for a stadium must be approved by two-thirds of San Diego's voters. This is an extremely high hurdle to clear. We remain committed to maintaining an open dialogue with the Chargers as we learn more details about their plan."